A major, universal principle of nature’s construction is that the greatest most intense activity and emphasis occurs at transition points. The artist combined science and art. He had a degree from UCLA in Psychology and Chemistry and a Doctor of Pharmacy degree from USC; adding to a few basic art courses (UCLA, USC, Art Institute of Chicago) has been an appreciable amount of self study. Reichold Chemical has supported his research in new methods using plastic. He worked in non-ferrous metals (stainless steel and bronze) alone and combined with hand-pigmented plastic using a collection of 347 dry pigments (supplied from worldwide companies: BASF, Pfizer, Sun Chemical, Bayer, and especially, CIBA-Geigy). His work is philosophically orientated. He won numerous awards in competitions and shows, had commissions in private and public art, and was a member of several art organizations. 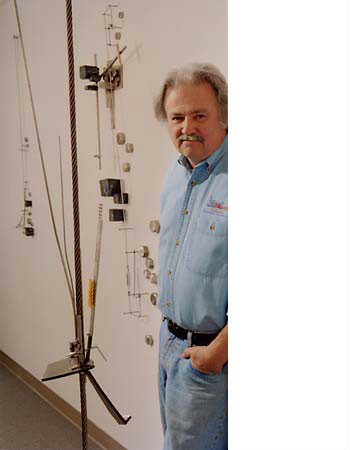 Bill McEwen’s documentation took place in 2009 and was sponsored by Paula Spellman. The FOTM Archive contains extensive information about this artist.